Select your replication source and target. Set up the source replication environment, including on-premises Site Recovery components, and the target replication environment. In Recovery Services vaults, select the vault. We prepared the vault ContosoVMVault in the previous tutorial. In Protection goal > Where are your machines located? select On-premises. In Where do you want to replicate your machines?, select To Azure. In Are your machines virtualized? select Yes, with Hyper-V. In Are you using System Center VMM to manage your Hyper-V hosts, select No. Then click OK. In Deployment planning, if you're planning a large deployment, download the Deployment Planner for Hyper-V from the link on the page. Learn more about Hyper-V deployment planning. For the purposes of this tutorial, we don't need the deployment planner. In Have you completed deployment planning? select I will do it later. Then click OK.
To set up the source environment, you create a Hyper-V site, and add Hyper-V hosts containing VMs you want to replicate to the site. 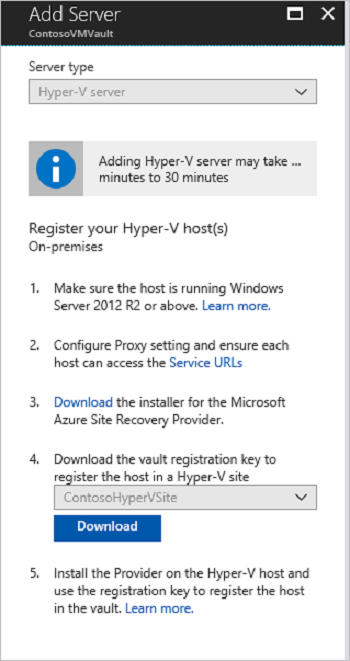 Then you download and install the Azure Site Recovery Provider and the Azure Recovery Services agent on each host, and register the Hyper-V site in the vault. Under Prepare Infrastructure, click Source. In Prepare source, click +Hyper-V Site. In Create Hyper-V site, and specify site name. We're using ContosoHyperVSite. 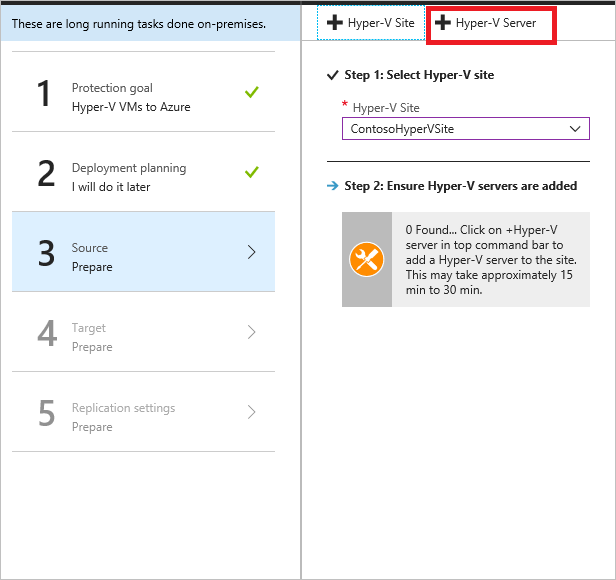 After the site is created, in Prepare source > Step 1: Select Hyper-V site, select the site you created. Download the installer for the Microsoft Azure Site Recovery Provider. Download the vault registration key. You need this key to install the Provider. The key is valid for five days after you generate it. Install the downloaded setup file (AzureSiteRecoveryProvider.exe) on each Hyper-V host you want to add to the Hyper-V site. Setup installs the Azure Site Recovery Provider and Recovery Services agent, on each Hyper-V host. In the Azure Site Recovery Provider Setup wizard > Microsoft Update, opt in to use Microsoft Update to check for Provider updates. In Installation, accept the default installation location for the Provider and agent, and click Install. After installation, in the Microsoft Azure Site Recovery Registration Wizard > Vault Settings, click Browse, and in Key File, select the vault key file that you downloaded. 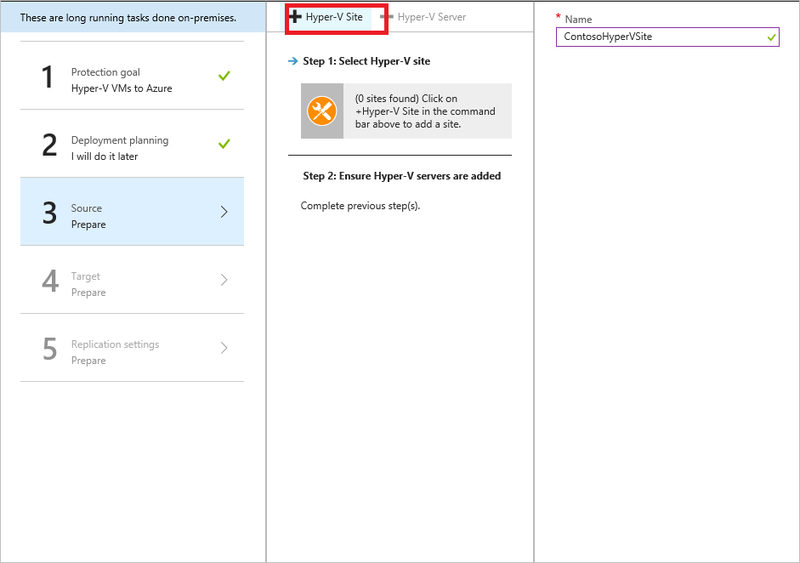 Specify the Azure Site Recovery subscription, the vault name (ContosoVMVault), and the Hyper-V site (ContosoHyperVSite) to which the Hyper-V server belongs. 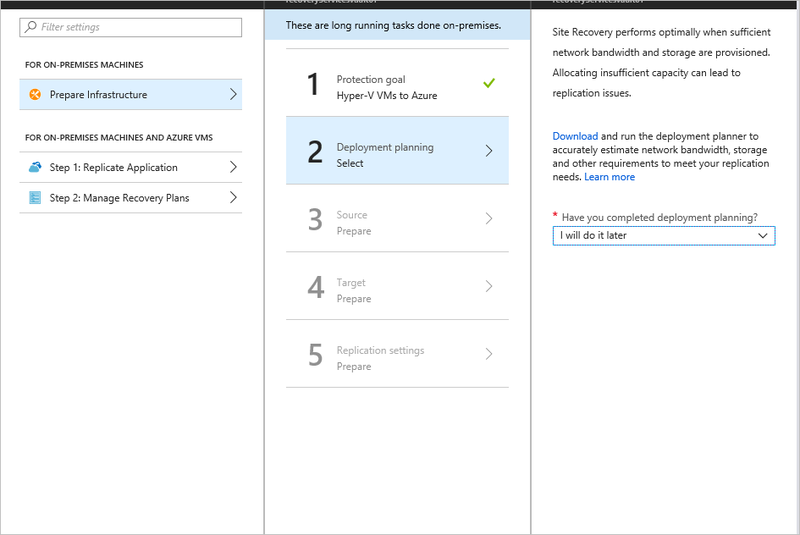 In Proxy Settings, select Connect directly to Azure Site Recovery without a proxy. In Registration, After the server is registered in the vault, click Finish. Metadata from the Hyper-V server is retrieved by Azure Site Recovery, and the server is displayed in Site Recovery Infrastructure > Hyper-V Hosts. This process can take up to 30 minutes. Run `.\setupdr.exe /i. Results are logged to %Programdata%\ASRLogs\DRASetupWizard.log. cd  C:\Program Files\Microsoft Azure Site Recovery Provider\DRConfigurator.exe" /r /Friendlyname "FriendlyName of the Server" /Credentials "path to where the credential file is saved"
Click Prepare infrastructure > Target. Select the subscription and the resource group ContosoRG, in which the Azure VMs will be created after failover. Select the Resource Manager" deployment model. Click Prepare infrastructure > Replication Settings > +Create and associate. In Create and associate policy, specify a policy name. We're using ContosoReplicationPolicy. For this tutorial we'll leave the default settings. Copy frequency indicates how often delta data (after initial replication) will replicate, every five minutes by default. Recovery point retention indicates that recovery points will be retained for two hours. 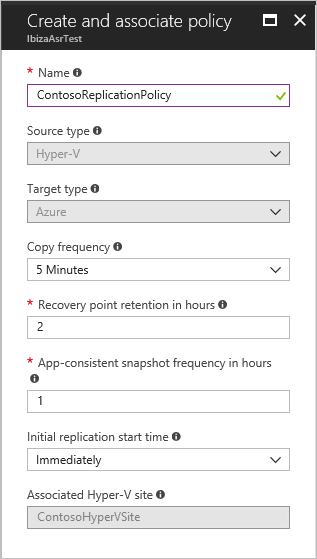 App-consistent snapshot frequency indicates that recovery points containing app-consistent snapshots will be created every hour. Initial replication start time, indicates that initial replication will start immediately. In Replicate application, click Source. In Source, select the ContosoHyperVSite site. Then click OK. In Target, verify Azure as the target, the vault subscription, and the Resource Manager deployment model. If you're using tutorial settings, select the contosovmsacct1910171607 storage account created in the previous tutorial for replicated data, and the ContosoASRnet network, in which Azure VMs will be located after failover. In Virtual machines > Select, select the VM you want to replicate. Then click OK.
You can track progress of the Enable Protection action in Jobs > Site Recovery jobs. After the Finalize Protection job completes, the initial replication is complete, and the virtual machine is ready for failover.